This tech-recipe will explain how to setup Windows 7 to automatically login a user account. This is handy for computers that you use as HTPC machines or even for a ‘guest’ computer that you want to login automatically to a restricted account. This should apply to all versions of Windows 7. 1. 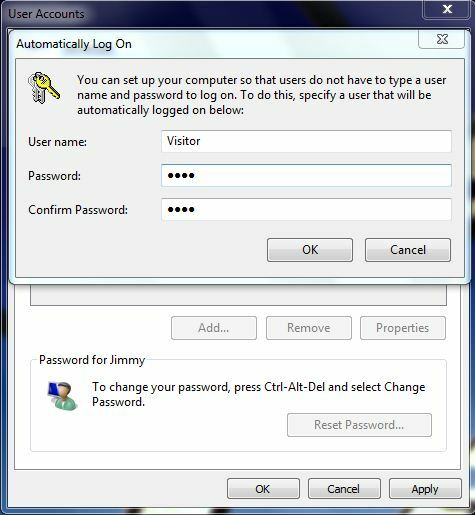 Login to Windows 7 as an administrator user account. The first account you setup on Windows 7 is an administrator account and has full rights to do nearly any task. 2. Go to you Start Menu and click on Run or Hold the Windows Key + hit the letter R to open up the “Run” dialog window. 4. This will bring up a new Window that lets us setup Windows 7 so that it can automatically login as a user on startup. On this screen, uncheck the “User must enter a user name and password to use this computer” at the top. 5. Click on OK. You will then be prompted to enter in the User and Password that you want to have Windows 7 login automatically as. In this example, I’m setup logging into my Visitor user account. 6. Finish by clicking OK and the next time you reboot, Windows 7 will login into the account automatically without any intervention from you.